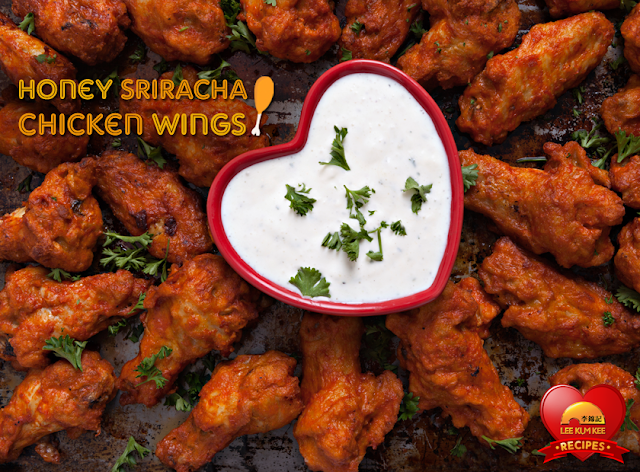 Taste the wings of love! Made these tasty morsels for my wing critics and they are hands down a favorite in our home. Just the right amount of spicy and loaded with flavor. 1. Preheat oven to 400F and line baking sheet with aluminum foil. 2. Melt butter in a small saucepan over medium heat. Whisk in the flour until slightly brown, about 1 minute. Stir in honey, Sriracha, Lee Kum Kee Premium Soy Sauce, Panda Brand Oyster Sauce and lime juice. Bring to boil; simmer until slightly thickened, about 1-2 minutes. 3. In a large bowl, combine wings, butter, vegetable oil, garlic powder, salt and pepper. 4. Place wings onto the prepared baking sheet and bake for 25-30 minutes, using metal tongs to turn at halfway through. Brush wings with Sriracha glaze and broil for 3-4 minutes, or until crisp and crusted on. Turn wings over and repeat. 5. Serve Immediately, garnish with cilantro leaves if desired. 1. Combine blue cheese, mayonnaise, sour cream and Worcestershire sauce together in a mixing bowl and mix until combined. Season with salt and pepper.